University of Florida College of Pharmacy prides itself on a rich tradition of excellence in pharmacy education, research and service. These facts showcase why UF is regarded as one of the top pharmacy colleges in the nation. The first woman graduate of the University of Florida received the Master of Science in Pharmacy degree. The University of Florida is one college with three campuses across the state: Gainesville, Jacksonville and Orlando. #1 ranked pharmacy college nationally in the number of graduates securing American Society of Health-System Pharmacists’ residency positions in 2016, 2017 and 2018. There are more than 12,500 living alumni from the UF College of Pharmacy residing in all 50 states and 41 countries around the world. 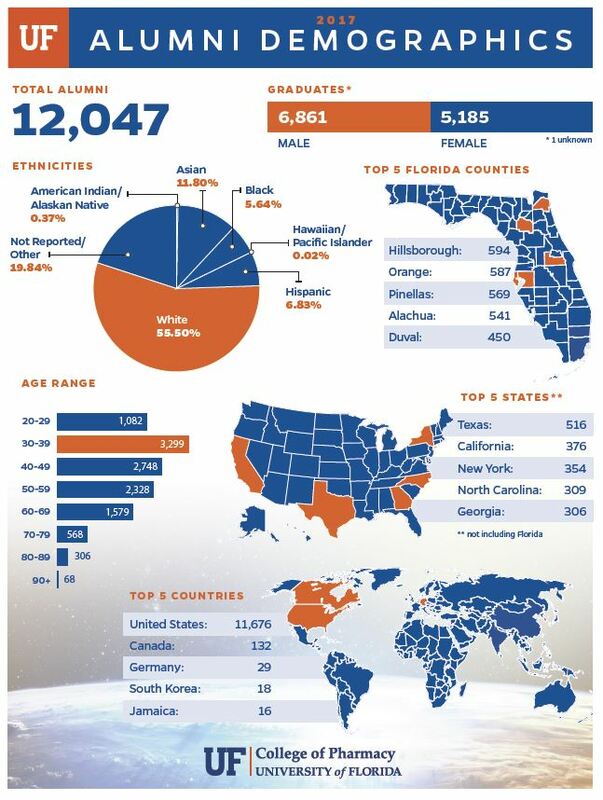 The Gator Nation represents a worldwide network of UF College of Pharmacy graduates.